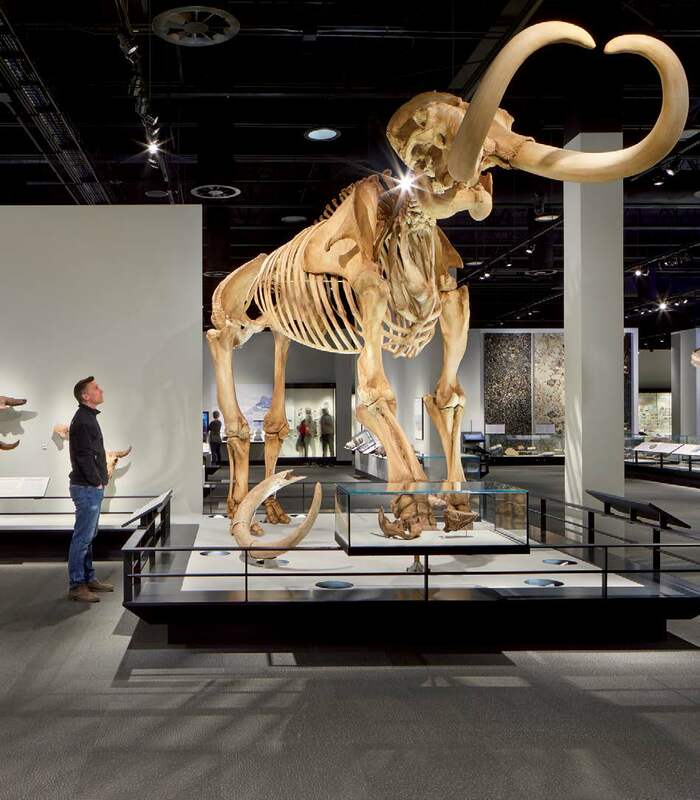 Opened in late 2018, the Royal Alberta Museum is the largest museum in Western Canada, housing both the human history and natural history of Alberta. The design, completed by DIALOG, aims to create a fully-accessible museum that is sustainable and contributes to a vibrant downtown. The Royal Alberta Museum, designed by DIALOG. The museum has been preserving, collecting and displaying the province’s history for over 50 years. After outgrowing their original home in west-central Edmonton, the Government of Alberta made the decision to move the Royal Alberta Museum to a new location in downtown Edmonton. 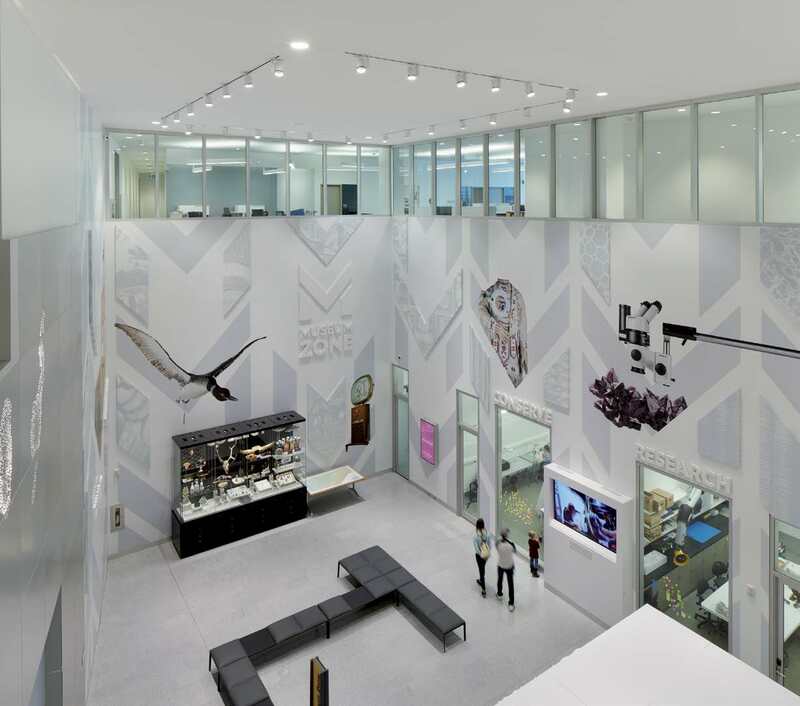 The blank canvas in the heart of the city presented a unique opportunity to create a perfectly-suited facility with more space for displays, growing collections, and state of the art research labs. The museum includes several exterior courtyards. The design creates a dynamic weaving of interior and exterior spaces. Nature is brought into the building through the gardens and terraces, and the building extends out into the landscape. The project scope includes 8,200 net square meters of natural history and human history long-term exhibition galleries, a children’s gallery and bug room, 4,300 net square meters of curatorial, research and collection spaces, a 1,100 square meter feature gallery and associated support space, totalling 22,000 net square meters. View of the museum at dusk. 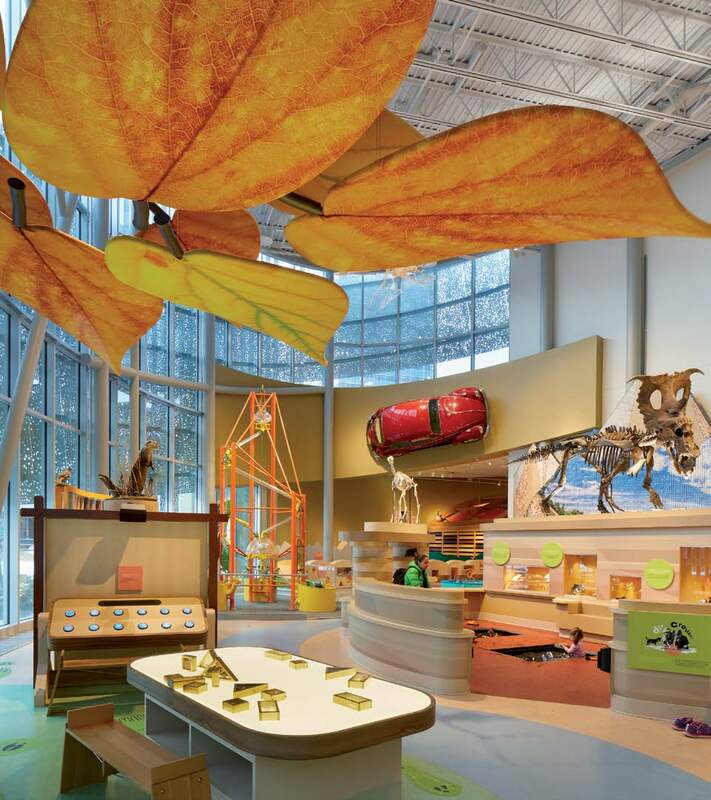 The Royal Alberta Museum project was tendered as a fast-track design-build competition. To be awarded the project, DIALOG competed in an international competition that required a full design be proposed. 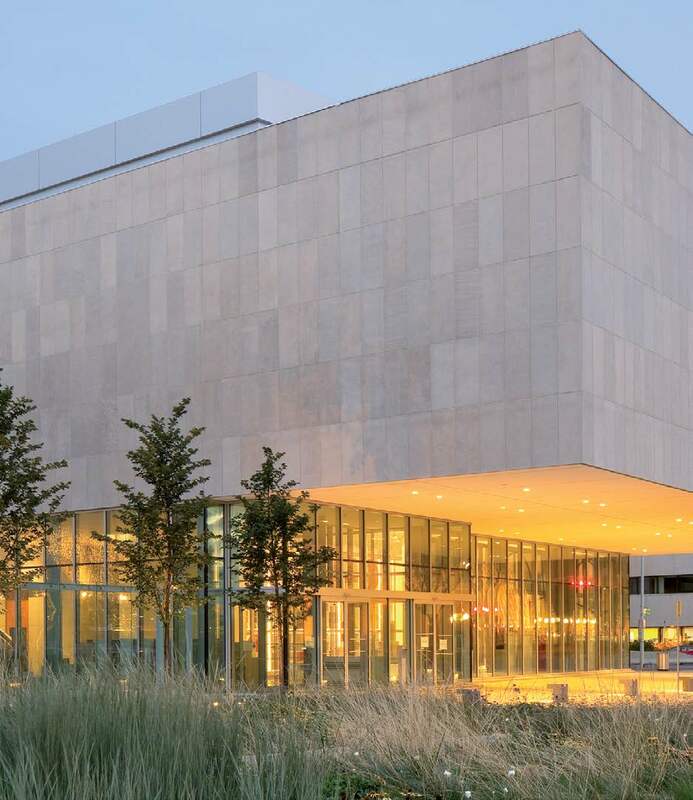 DIALOG teamed up with museum planner Michael Lundholm and with contractor Ledcor. The collection of subtrades that Ledcor’s team offered was aligned in DIALOG’s values for community wellbeing and building something that is right for the city and province. For two months, the design team worked closely with Ledcor to submit a complete design. 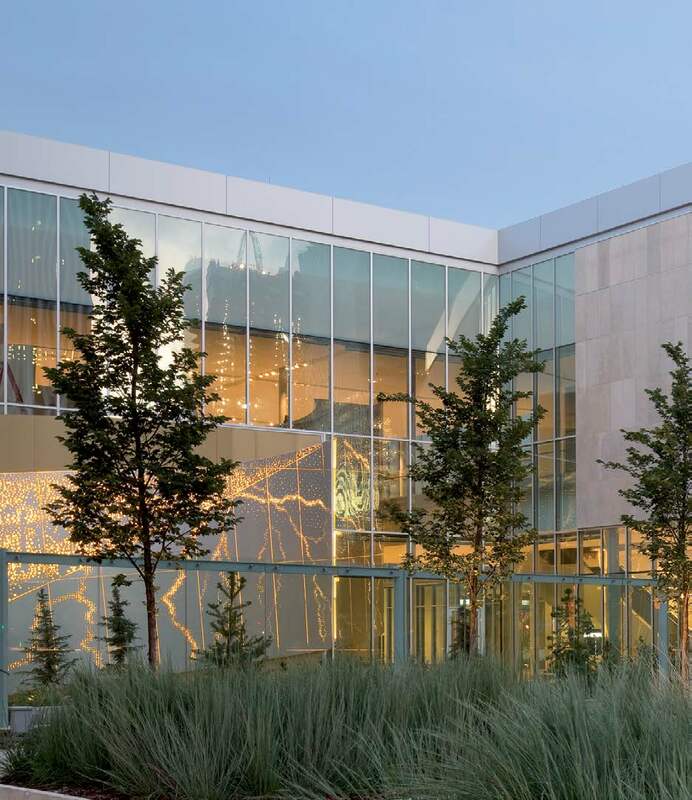 The deep understanding of the site and its context, as well as the efficient back of house design, presented the Royal Alberta Museum with a design that is true to their mission and values. 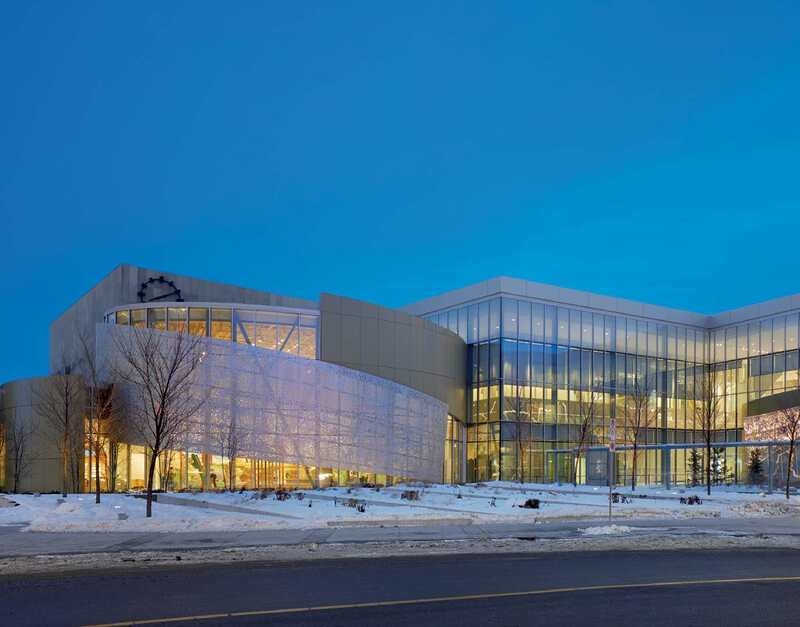 Once the team was selected, the DIALOG & Lundholm – Ledcor design-build team worked collaboatively with Alberta Infrastructure and the Royal Alberta Museum to refine the design and deliver the finished product. Royal Alberta Museum has core values of equity and transparency that are reflected through the design of their new space. Though the galleries themselves have strict environmental conditions, the design’s public spaces are daylit, and the spacious, bright lobby is open to the public, acting as a central wayfinding point. 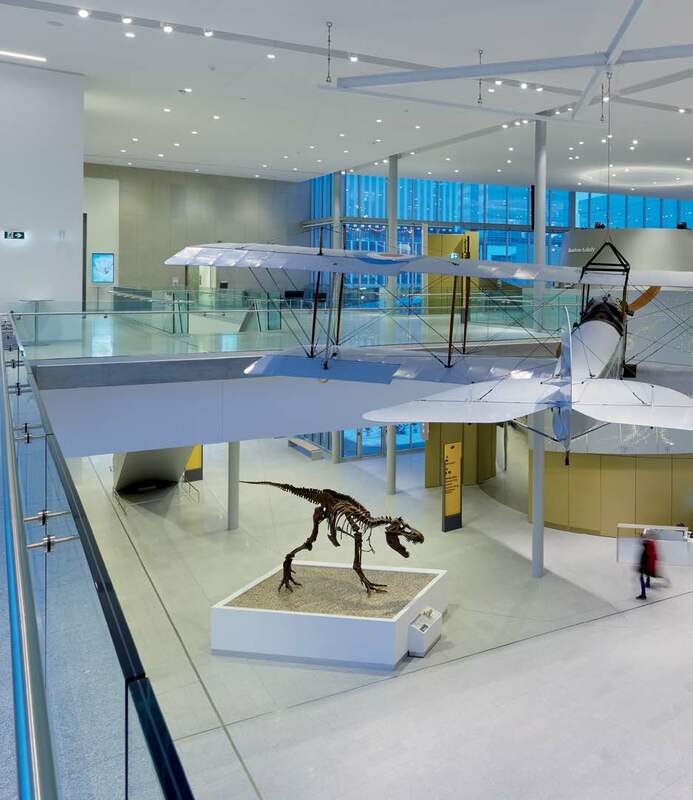 Artifacts are on display in the lobby include an airplane, Albertasaurus and a mammoth cast. From the lobby, visitors can see into the Children’s Gallery and its Bug Room (the only galleries where natural light will not harm the contents). Windows allow views into the research laboratories to reveal the museum’s scientific work. Many Albertans don’t realize how active Royal Alberta Museum is in the preservation and research of Alberta’s history, so this is an eye-opening feature of the new building, enhancing transparency and equity. Upstairs, the Manitou Asinîy Gallery is open to the public with access to the Manitou stone. Inside the museum, the main galleries are offset by 17 degrees, aligning with the historic grids that represent the human history of the site. The Royal Alberta Museum is intentionally designed in its downtown site. It lies at the intersection of Canada’s two survey traditions: the British Cartesian grid that follows true north, south, east, west (like most of Alberta), and the seigneurial grid from early French settlers that aligns with river frontage, the city’s original ‘main street.’ Inside the museum, the main galleries are offset by 17 degrees, aligning with the historic grids that represent the human history of the site. Being inside the Children’s Gallery evokes the feeling of being within a tree fort in Alberta’s lush Boreal Forest. 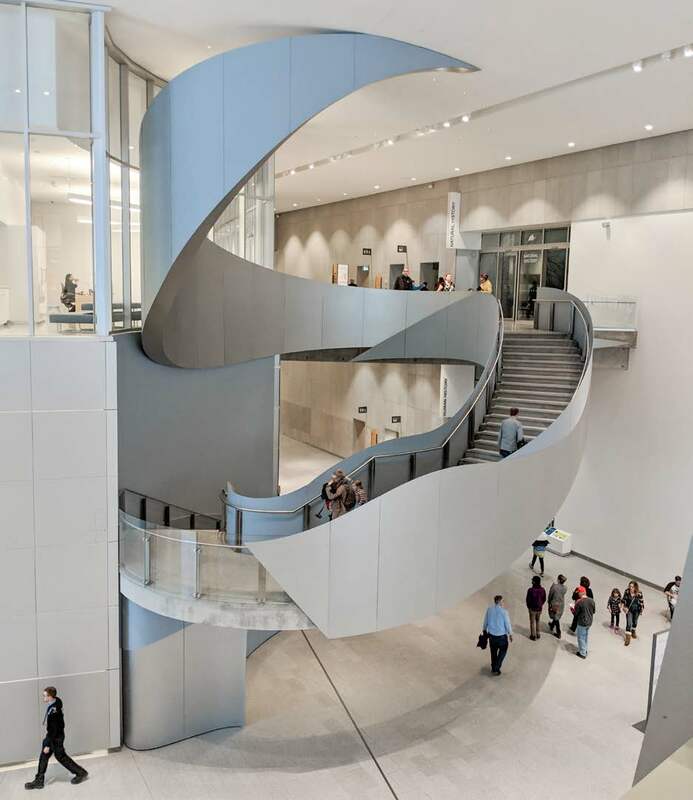 Other spaces such as the Children’s Gallery and feature staircase are more curvilinear in shape, reflecting the winding North Saskatchewan River that makes its way through Edmonton, and the natural history of the site. Two outdoor courtyards are exact alignments of streets that were lost over years of development in downtown Edmonton. An image of lightning is abstracted and laser cut into metal panels that wrap around the curving surfaces of The Roundhouse. 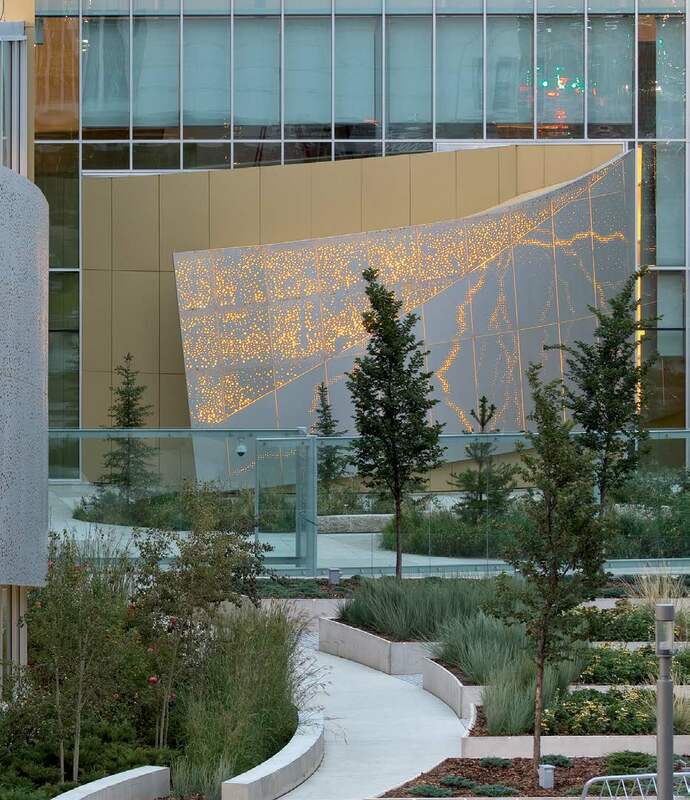 On the facade, an image of lightning is abstracted and laser cut into metal panels that wrap around the curving surfaces of The Roundhouse, animating the surface and referencing the Alberta sky. Inside, the polished walls reflect and merge images of the building, the landscape and the visitor. Functionally, concrete two-way flat plate slabs were selected for most museum floors for their efficiency and cost-effective support of the heavy loads of displays and stored collections. The high thermal mass of the concrete structure is used to store heat, helping protect against temperature fluctuations. This thermal flywheel effect allows for reduced dependence on mechanical systems, and helps protect the museum’s collections in the event of a power outage. The robust nature of the concrete structure allows the building to meet its 100 year design life. Galleries are large, open and flexible spaces that can accommodate a variety of exhibit display requirements over the next 100 years. Architecturally exposed concrete surfaces can be found throughout including columns, slab surfaces, edges and soffits. This required a high level of expertise for execution—condition, alignment and tolerance of formwork was critical, and coordination of joint locations, tie holes, chairs, and cast-in services were precisely coordinated. A sculptural stair evoking the flow of water-carved canyons through the Rocky Mountains draws the eye upward and invites the visitor to ascend toward the stories of Alberta’s natural history. The staircase leading up to the natural history gallery is a concrete art piece. Designed to mimic the canyons carved by water in Alberta’s Rocky Mountains, the architecturally exposed, cast-in-place concrete spiral rises 8 m and spans more than 18 m. The cross section of the stair is rectangular with varying depth (from 400 mm to 1150 mm) to suit the structural strength and architectural requirements. During construction, reinforcing was hung off temporary beams spanning across the formwork from above so that chair marks are not visible on the exposed soffit. The $375.5-million project was funded with $253 million from the Government of Alberta and $122.5 million from the federal government Building Canada fund.